To date most of our stories about Kenley have featured men. To mark International Women’s Day 2017 on 8 March we thought it was timely to record the amazing life of one of Britain’s foundation glider pilots who had a Kenley connection. Ann Welch (1917-2002) was a world-class glider pilot and an aviator who flew more than 100 aircraft types, from gliders to Wellington bombers. During a holiday in Cornwall in 1930, she had her first flight in an Airspeed Ferry of Alan Cobham’s Circus which travelled around the country giving many people their first close-up taste of aviation. “I was a small, skinny and tousle-headed thirteen-year-old, the year was 1930, and I wanted to fly”. As a 16-year old living within cycling distance of Biggin Hill, Croydon and Kenley, Ann would cycle to the airfields to watch aircraft. She learnt to fly, going solo in September 1934 in a Tiger Moth at Barnstaple, Devon while on holiday. On her return home, she joined the Brooklands Aero Club – now the site of the excellent aviation and motor museum – gaining her pilot’s licence in October that year. She funded her flying by selling artwork to Flight and Aeroplane magazines. In 1937 Ann took up gliding at Dunstable aerodrome near Luton, home of the London Gliding Club, and became an instructor. 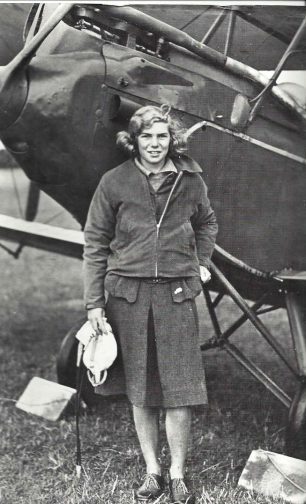 In October 1938, she was a founding member of the Surrey Gliding Club at Buckland in Surrey, between Dorking and Reigate. Aged 21, she was the club’s chief, and only, instructor. That year she travelled to the Berchtesgaden Alps, the site of Adolph Hitler’s summer residence, with a group of other young British glider pilots at the invitation of their German counterparts. When not flying, efforts were made to subvert the loyalty of these prospective RAF recruits. Hitler’s deputy, Rudolf Hess, was among those who attempted to indoctrinate the party – unsuccessfully. The ATA was an organisation of civilian pilots who collected new aircraft from factories and delivered them to front-line RAF and RNAS airfields across the UK. During the war, 1245 men and women of the ATA from 25 countries ferried nearly 309,000 aircraft of 147 different types, without radios, with no instrument flying instruction and at the mercy of the British weather. Often they flew aircraft they’d never seen after quickly reading the single page about the aircraft in the superb Ferry Pilot’s Notes which fitted into the breast pocket of the ATA uniform. “It was all THERE,” as Ann put it. The brilliantly succinct notes enabled ATA pilots to fly dozens of different types; sometimes three or four in a day. It could be exacting, dangerous work – 173 ATA pilots died during the war. During her time in the ATA, Ann flew many different types of aircraft including Tiger Moth trainers, Blenheim fighter-bombers, Spitfire and Hurricane fighters, as well as Wellington bombers. Her work as an ATA pilot came to an end in 1944 with the birth of her first daughter. After the war, in 1946, Ann restarted the Surrey Gliding Club at RAF Kenley, initially with five members – but no aircraft. Almost all the country’s gliders had been requisitioned by the RAF and had been broken up or rotten away in unsuitable storage conditions during the war. Their first glider, a Weihe, was an ex-German requisition. In 1947 the club relocated to nearby Redhill airfield – it wouldn’t return to Kenley until 1985 as the Surrey Hills Gliding Club which still flies from the airfield. Ann worked hard to re-establish the British Gliding Association, resigning as its vice chairman in 1976. 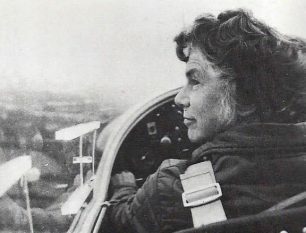 She managed the British Team at the World Gliding Championships between 1948 and 1968. She presided over the formation of the British Hang-Gliding Association in 1974 and was president of the British Microlight Association. She was also a Fellow of the Royal Aeronautical Society and in 1997 was elected as an Honorary Fellow of the Royal Institute of Navigation. Awarded an MBE and OBE for services to gliding, Ann Welch was an amazing all-rounder. A mother of three girls, she was a pilot, an instructor, a flying competition organiser, national administrator, author, painter, skier and one of Kenley’s famous faces. Ann Welch (1983): Happy to Fly – an Autobiography. John Murray Publisher Ltd., 256p. Giles Whittell (2007): Spitfire Women of World War II. Harper Press, 304p.